David Ritt is originally from Long Island, New York. 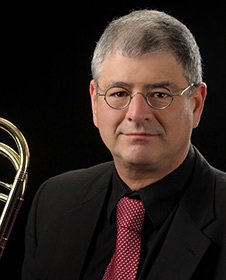 He attended the Eastman School of Music, and played briefly in the orchestras of Singapore and Ft. Wayne, Indiana, before moving to Seattle to join the Seattle Symphony in 1981. A versatile performer, Ritt enjoys playing various styles of music besides classical, especially jazz and salsa. When not performing, he arranges and composes for the trombone.